Hello everyone! I have so many reviews piling up that I need to get through, so expect to see a lot more in the coming weeks/months. Today let’s review one of the most used and recommended “all-in-one” orchestral libraries, Spitfire’s Albion ONE. 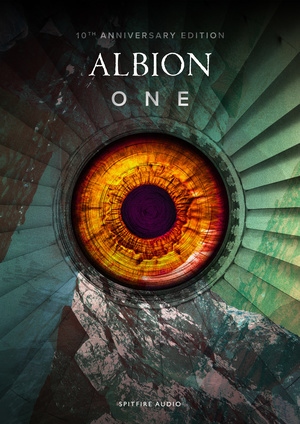 Albion ONE is the 10th anniversary re-release of their original Albion library. If you ever search around sampling/virtual instrument forums, this library is guaranteed to come up all over the place, constantly being recommended to beginners for it’s all inclusive approach, and for a good reason. This library has everything you need to write an orchestral track, saving time and hassle by having large sections that are easy to pick up and play instantly. Albion One combines the separate string instruments into one full-section patch, and the brass is split into Low, Mid, and High sections, while the woodwinds are split into High and Low. Each patch will load the most used articulations, including shorts (spiccato, staccato, pizzicato, etc) and longs (sustains), with additional legato patches for strings, woods, and brass. Large sections like this are fantastic for beginners and for those on tight deadlines, and helps in keeping the resource consumption to a minimum while providing big sound palletes to instantly play with. This product really succeeds at being instantly usable right out of the box, and everything is recorded quite wet in their acclaimed Air Studios. It is great for beginners or those who aren’t full time composers and don’t want to dive to deep into orchestral writing and just need say, small string or brass sections in the background of a symphonic metal song or some other genre. The sound is overall quite good, even if the hall/reverb is baked in (which is a plus for some!). Instruments are all recorded centered, lacking the ability to properly pan instruments as they are combined into larger sections. I’ve also noticed all Spitfire libraries are VERY quiet when you load them up. I always have to turn them up +6.0 db to get them to match the rest of my orchestral samples, which isn’t a problem, just an observation worth noting. The things I absolutely love about this library: The staccato and spicatto articulations are phenomenal! The short strings are an all time favorite and for a large ensemble have yet to be beat in my opinion. They sound absolutely impeccable and truly thunderous in the lower ranges, yet still provide a great amount of detail. Load this patch up for instant inspiration and endless hours of fun just playing on the keys. The low brass is also a favorite of mine, and provides an amazing amount of brassy bite and grit for intense action sequences (especially the “nasty” articulation). The Brunel Loops are subtle and very unique, providing wonderful textures of found percussive sounds and warped and processed to create clockwork style percussive loops, and the Darwin Percussion ensembles provided are also top notch and fill out the loud intense end of the percussion spectrum. I have yet to find such hard hitting drums in the lower register. The legato strings patches are also surprisingly good, giving off a rich, soaring Hollywood vibe. Think John William’s ET finale. Some small quibbles keep this from being a perfect collection. Albion One advertises itself as “Epic Composer Tools” and I honestly have to somewhat disagree with this. Some of the sounds are incredible and are used in every single one of my compositions, but this library tops out fairly early in terms of dynamics, and is quite lacking in the horn section of the brass, which in my opinion is absolutely one of the most important section for epic music. I do realize you won’t get JUST the horn section as it’s combined into mid brass or high brass, but the mid brass especially is radically lacking bite and intensity in the sustains. The long strings are also overly synthetic and are rarely used for me, but they get the job done. Overall the middle ranges in this library are a bit muddy and lacking clarity to my ears, and I mostly use this for the lower end of the spectrum. I find this library has a strange dynamic range, as it’s not quite loud and bold enough for over the top epic, but also provides inconsistencies across the dynamic ranges, not providing a smooth enough transition from soft to (semi)loud. I can absolutely see why this is such highly recommended for beginners, as it offers a very large amount of content and you get a lot of bang for your buck. The amazing and unmatched quality of some of the patches are sadly contrasted by synthetic string sustains and an overly muddy middle range. I still frequently use this as a base for writing a lot of my action oriented pieces, and then layering more detailed sections on top. It is one I will probably always keep on my system for the short strings and low brass patches alone, even if it doesn’t cover all my needs and provide enough detail for what I write these days. + Unbeatable Low Brass and Short Strings. +Hard Hitting Percussion could be the only ones you need. +Brunel Loops and Stephenson’s Steam Band synths are wonderful and unique. + Perfect way to build a foundation for a more detailed piece, or for sketching. - Not for detailed writing with the included patches, no solo instruments or sections. - Sometimes overly muddy sound, especially in middle range (especially long brass) is lacking clarity and bite. - Doesn’t cover enough of a dynamic range to be truly epic or for subtle/delicate passages. - Lacking a piano of any kind which would round out the package quite well.